The theme of “galleries” or “pergolas” was already present in tapestries throughout the sixteenth century and continued to be popular in the following century. This genre is characterised by the central motif of a scene made up of varied architectural structures which hold up, or are mixed with, espaliers and other plant motifs, reason why they are usually called “verdures”. Another feature typical to the genre is the appearance of majestic bouquets of flowers put on display beneath pergolas. Sometimes we even see the presence of animals or characters which bring the compositions to life. Over the course of the sixteenth century, these scenes became independent of the mythological scenes in whose borders they had previously been used. They enjoyed great success, with a great number of series (some more valuable than others) being weaved. 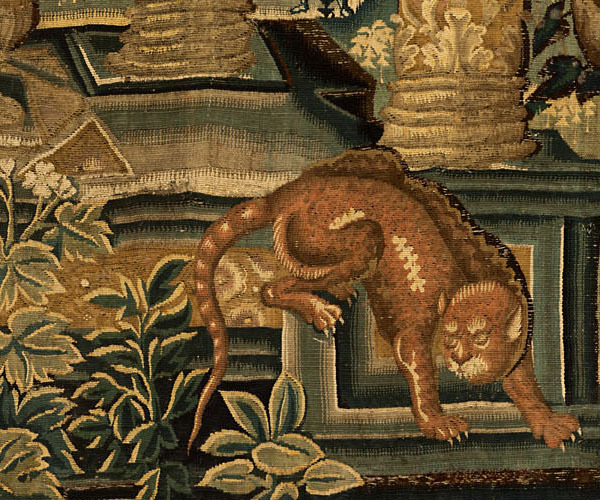 These tapestries constantly adapted the general scheme to the decorative tastes of the moment. 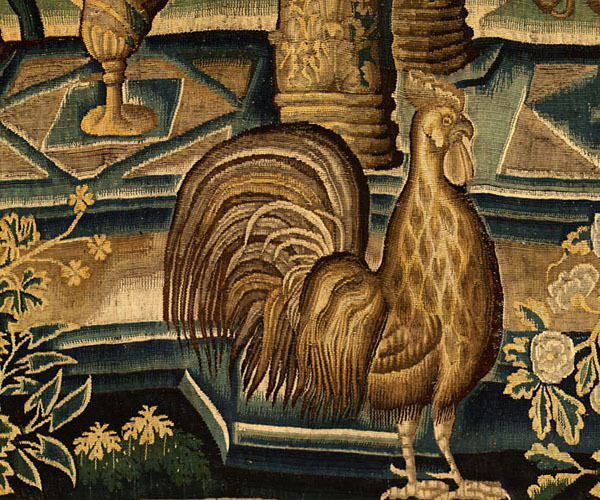 Although these decorative tapestries were produced most frequently in Brussels, other Flemish tapestry-making centres produced a number of series which can still be traced in various collections. In inventories, they usually appear under the name “gardening scenes” or “galleries and flowers”. 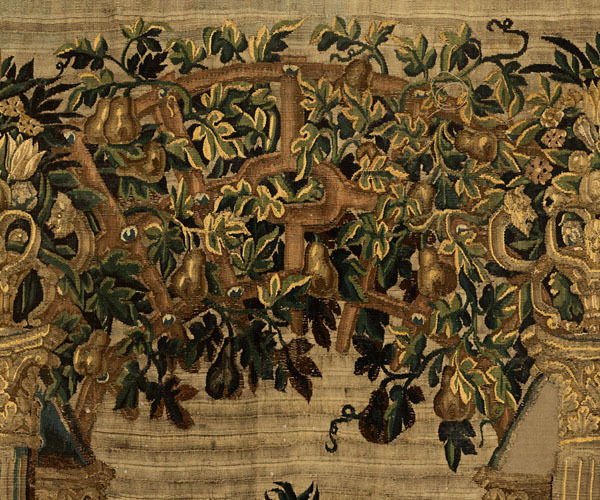 The extravagant scenes of the Vertumnus and Pomona tapestries mark a decisive stage in the development of the genre. These scenes were seen for the first time in the tapestries of gardens of Cardinal Granvelle, which were weaved around 1560. Extravagant columns designed with perspective, marble terraces, pergolas and galleries almost completely take over the scenes. The engravings of Vredeman de Vries, which were being disseminated at the time, added variety and a sense of perspective to the architectural models depicted in the tapestries, which changed continually from one generation to the next. Series 67, along with other National Heritage series, is an example of some of these Baroque-style “galleries”, in keeping with early seventeenth-century tastes. Hung beside each other, the whole set was intended to recreate the atmosphere of a winter-garden. At the end of the nineteenth century, several tapestries of this type could be found in the Armoury at the Royal Palace of Madrid. 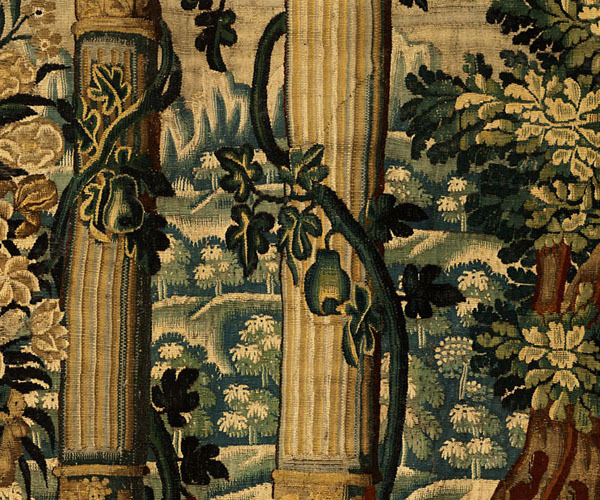 The same structure of pergolas is repeated in all of the tapestries in this series, although the architectural features change along with the plant species which cover them. The second and tenth tapestries in the series, which are on display in the Royal Palace of Aranjuez, are very similar, but a close inspection reveals some small differences in detail. The scenes are framed by side- and upper-borders dominated bytwo imposing Solomonic columns, a model which became extremely popular in the Baroque period. The Solomonic column was first introduced into a tapestry by Rubens in his design for the series The Triumph of the Eucharist. Tapestries from this series are kept in the Monastery of the Descalzas Reales in Madrid, with a replica kept in Oncala, Soria. P. Junquera de Vega and C. Díaz Gallegos, Catálogo de tapices del Patrimonio Nacional. Volumen II: Siglo XVII, Madrid, 1986, pp. 222-231. Guy Delmarcel, La tapisserie flamande du XVe au XVIIIe siècle, Tielt, 1999, pp. 132-133 and 139-140. 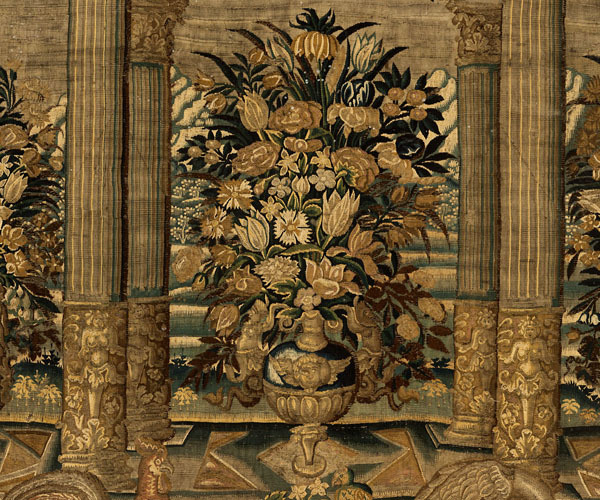 Tapestry in the Baroque: Threads of Splendor. Metropolitan Museum of Art, dir. Thomas P. Campbell, 2007, pp. 66-69 and 208.